The city of Morro Bay is just one of 482 cities in the state frantically working on local cannabis regulations before a January 2018 deadline. California voters approved Proposition 64 last November, making the use of recreational marijuana legal for adults 21 and older, and jurisdictions have been grappling with what the local rules should be before the state sets its own in stone. In San Luis Obispo County, some cities are opting out of having recreational and/or medical dispensaries in their communities, but Morro Bay is considering a different route—allowing two medical marijuana dispensaries. BRICK AND MORTAR A Morro Bay cannabis ordinance proposes allowing two medical marijuana dispensaries. At the Oct. 24 City Council meeting, Assistant City Attorney Chris Neumeyer gave the first reading of the proposed cannabis ordinance, laying the groundwork for dispensaries, personal cultivation, and public use. "If the city does not exercise local control over these commercial cannabis businesses, the city will cede a significant amount of authority to the state," Neumeyer said. While the ordinance hasn't been voted on just yet, it proposes having two medical marijuana dispensaries in a central business area of the community and requires that the businesses be at least 100 feet from each other. Under the ordinance, dispensaries would have to be 600 feet from schools, day cares, and youth centers and 100 feet from parks. The city could begin accepting applications from medical marijuana dispensary operators on July 1, 2018. Dispensaries would be prohibited from growing marijuana or hiring physicians to sell medical marijuana recommendations on-site. City Councilmember Robert Davis played a role in working on the proposed ordinance, and he said that allowing the sale of medical marijuana in Morro Bay is a matter of compassion. "I think every council member has voiced their support for medical marijuana from the dais. I have not heard a single community complaint about it," Davis said. He added that the city wanted to provide an opportunity for this type of dispensary and that allowing two to set up shop would create a level of business competition. The proposed ordinance prohibits recreational marijuana dispensaries and delivery services from operating within city limits. Davis said that he believes the city isn't sure if it's ready for adult recreational use of cannabis. "We understand that California voters chose legalization of adult use, and I think we are willing to go that route if Morro Bay voters approve," Davis said. "But we want to proceed with little steps, trying to avoid making big mistakes before we truly understand the new environment." The city is planning to craft a possible ballot measure for the November 2018 election that would create a cannabis tax. "That will give our voters one more chance to specifically say 'yes' or 'no' to recreational use and to a reasonable tax structure behind it," Davis said. With medical marijuana dispensaries in place, Davis said, the city would be able to gain some experience with the cannabis business environment and apply it to future regulations. Morro Bay could be the only spot on the North Coast that will have brick-and-mortar dispensaries. Although the county has yet to finalize an ordinance, the San Luis Obispo County Board of Supervisors is moving in the direction of banning all brick-and-mortar dispensaries in unincorporated communities. That includes the coastal communities of Los Osos, Cayucos, Cambria, San Simeon, and Harmony—which are served by 2nd District Supervisor Bruce Gibson. Gibson said that although he won't weigh in on Morro Bay's effort to create the ordinance, he believes the city is working on regulations that make sense for its residents. "I do think every jurisdiction needs to think carefully about putting forward a reasonable and balanced approach to regulating cannabis. We can't be too lax or too tight on these regulations or we risk some unintended consequences," Gibson said. Other cities in the county are still drafting their ordinances. The city of SLO is undergoing research and outreach. Atascadero is banning brick-and-mortar dispensaries within city limits and anything other than personal cultivation. It will allow testing facilities and mobile deliveries to serve its residents. Grover Beach is allowing medical marijuana businesses, which includes nurseries, testing labs, manufacturing facilities, and brick-and-mortar dispensaries. In Morro Bay, the proposed ordinance requires would-be personal cultivators to obtain a cultivation permit from the city. The fee for the permit hasn't been determined yet, but it will be waived until July 1, 2018. 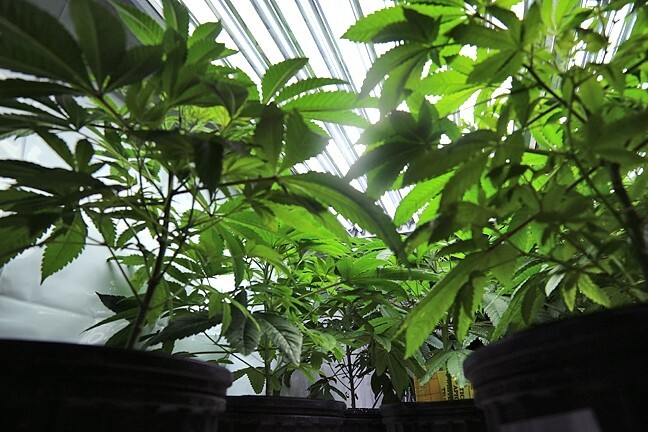 By state law, individuals are allowed to grow up to six marijuana plants on their property. Under the city's ordinance two of those plants can be grown outdoors, if they are at least 10 feet from the property line and out of sight. The City Council discussed tightening its regulations on the public use of cannabis and possibly prohibiting smoking marijuana in public places and in cars.